FREE Parking in our parking lot! ﻿Proudly serving the Olympia area since 2004. 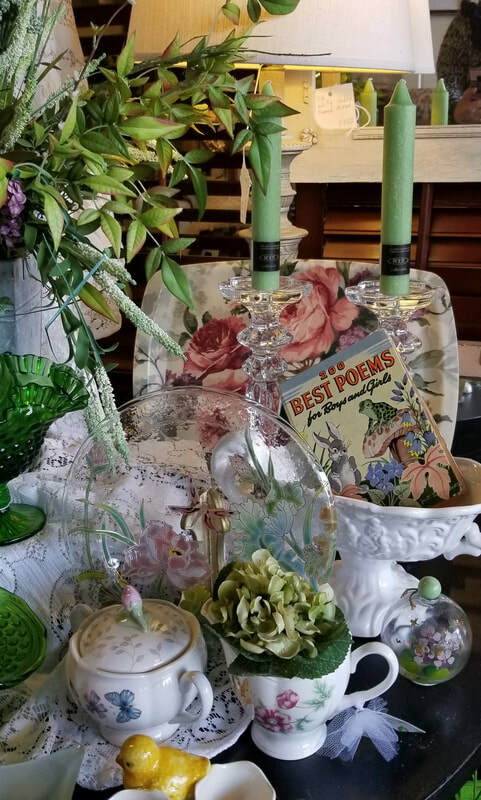 Two Floors with an extensive inventory of Antiques, Furniture, Accessories, Home Decor, Jewelry and Gifts. We are an authorized Annie Sloan Chalk Paint® Stockist and offer How-to classes in our Studio 721 area Upstairs. Featured products include: Paint-EZE™ no mess paint dispensers, Efex Decorative Latex Appliques and Artisan Enhancements products. Courtyard Antiques Olympia has 70 of Western Washington's finest antique and Home Decor Dealers within our 10,000sq ft retail store. They offer an endless variety of antiques, furniture, gifts, and decorating items for your home, garden, cottage or castle. Courtyard Antiques Olympia also provides onsite services at our Courtyard Studio 721 area upstairs, such as: classes on How-To create the French Look using Chalk Paint®, color selection and techniques and how-to reupholster a chair to name a few. See our Classes page for current course offerings and schedules. Please visit our Gallery Page to watch a slideshow and sample some of the offerings from our 70+ dealers. Annie Sloan Chalk Paint® and Accessories, Efex Appliques, Artisan Enhancements Products and Paint-EZE™ Dispensers are available for purchase in store or for a shipping quote call Mary @ 360-352-3854 or you may purchase Painting accessories from our web store EZE-Solutions.com. Please Note that inventory at Courtyard Antiques is ever evolving. What you see pictured may not currently be available. New items are arriving daily.